The title of Peter Sterling’s biography, Sterlo: The Story of a Champion (1990) best sums up the career of the P’matta and Australian Test halfback. Queensland-born but raised in the Riverina, the blond-haired teenager came to Fairfield Patrician Brothers on a scholarship in 1978. Sterling was a five-eighth then but incredibly, made his first grade debut as a stand-in fullback in the major semi-final replay against Manly in 1978. Sterling was always tipped for stardom, from his early high school days to his baptism in P’matta’s top grade. Shifting to halfback (Mick Pattison was the first grade pivot at the time) he made his State of Origin debut in 1981 and played in the club’s first grand final victory. After another grand final success in 1982, he toured with the Kangaroos. 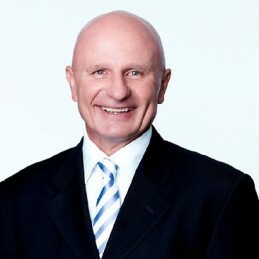 Sterling was in such great form that he kept Steve Mortimer out of all five Tests on the unbeaten tour, forming a champion partnership with Brett Kenny at club and Test level. It has been said that his major strength was that he did everything brilliantly -he possessed an immaculate kicking game, was a courageous defender, a great tactician and a masterful ballplayer. Sterling played in one Test against NZ in 1983 and made it three grand finals in a row with the Eels. Having already showed a liking for English club football, he played for Hull in 1983-84, vacating his Test spot, and it would not be until 1986 that he would recapture the top halfback position. Sterling was inspirational in Hull’s Yorkshire Cup victory and in early 1985, played one of the best games seen in a losing side in the Wembley Challenge Cup final. Sterling drove his side from a 28-12 deficit to ultimately go down to a Brett Kenny-inspired Wigan, 28-24. England had seen something very special. Sterling, who first captained NSW Country in 1984, returned to concentrate on his Australian career in 1986 and after playing in three Tests against NZ, won the inaugural Clive Churchill Medal in P’matta’s 4-2 grand final win over C’bury. Sterling made his second Kangaroo tour that year and for the second time, played in every Test on an unbeaten tour. Tests against NZ (1987) and Great Britain (1988) followed and he was also NSW captain in the promotional State of Origin match at Veteran’s Stadium (USA) in 1987. However, it was his great efforts with the declining P’matta club that gained ultimate recognition in his later career. (Sterling produced what is regarded as his perfect game in the club match against Easts in 1987). Voted ‘Dally M’ Player of the Year in 1986-87 and prestigious Rothmans Medal winner in 1987 and 1990, Sterling also won the ‘Golden Boot’ award for the finest player in international league (tied with NZ’s Hugh McGahan) in 1989. A recurring shoulder injury ended his career in 1992 but his easygoing manner coupled with a sharp intelligence has seen him easily make the transition to media commentator with Channel 9. In 2006 Sterling was inducted into the ARL Hall of Fame.